DAWSONVILLE, Ga. — Gordon Pirkle Jr. turns his attention from the grill at the Dawsonville Pool Room and wheels around to the counter with a story. It’s hereditary, a talent passed down from his father, Gordon Sr., the owner of the place and a legendary racing historian. With fresh hamburgers sizzling behind him, the next-generation Pirkle — “G.P.” as he’s known — recalls a conversation he had with his father as the NASCAR Playoffs were set to begin. “We made Chase’s car!” G.P. told his father, who initially didn’t understand what his son meant. “I said, you haven’t seen the si-reen on the side of the car, with the 9?” Pirkle Jr. said, referring to the emoji image that rides along with Dawsonville’s favorite son, Chase Elliott, for the season’s 10-race home stretch. The siren — more accurately “si-REEN” to hear the Pirkles say it — has become an endearing symbol in this otherwise quiet town in northern Georgia. 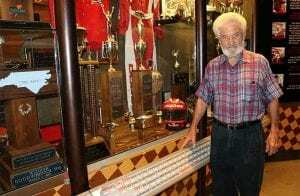 It’s the blaring signal of pride for the voluminous racing accomplishments of its hometown residents, like his Hall of Fame father Bill before him and generations of stock-car pioneers before him. That pride is reciprocal. It’s why the 22-year-old Elliott chose to honor the Pool Room with a rendering of the siren beside the door numbers on his No. 9 Chevrolet. It’s just like it was when Bill used to win. 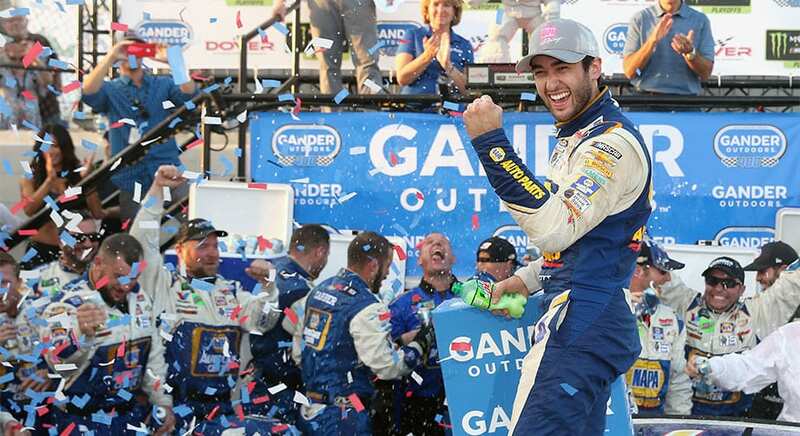 This week, the sign outside the Pool Room has read “CHASE ELLIOTT WINS DOVER,” a lasting tribute for a season that has energized this town of some 2,500 residents, building a bridge from its racing and moonshining past to today. “Well, don’t blink or you’ll miss it,” Chase Elliott says when pressed for advice to give to a first-time visitor to Dawsonville. It’s more a reference to the town’s bucolic feel than anything. Blinking or not, there are many can’t-miss qualities. For one, the street names jump off the map. 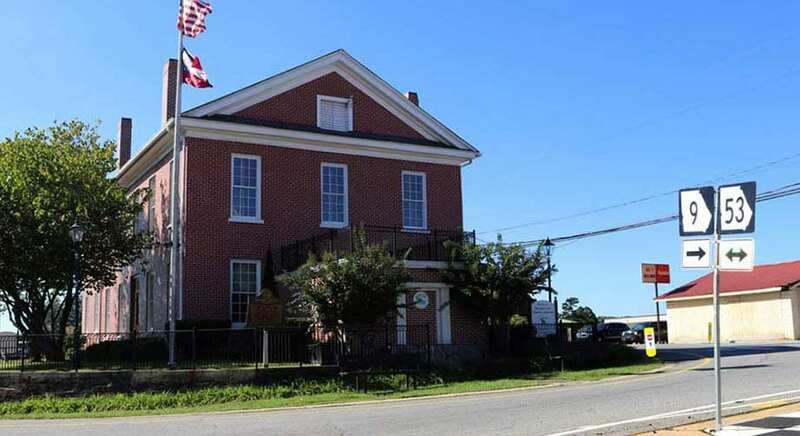 The Dawsonville Pool Room fittingly sits at 9 Bill Elliott Street, just a short block from the central traffic circle around the historic county courthouse. To its east, Gober Sosebee Street crosses Main. To the west, the names of long-ago trailblazers Raymond Parks, Roy Hall and Lloyd Seay adorn the signs. All that’s left is to potentially rename Academy Avenue, parallel to the main drag, in honor of the town’s current-day NASCAR star, providing the delicious prospect of walking down the hill from the Pool Room to the corner of Chase and Bill. Just half a mile from downtown is another epicenter. It’s where you’ll find 81-year-old Gordon Pirkle Sr., who still comes to work each day at the Georgia Racing Hall of Fame. The museum is stuffed with cars inches apart, historic memorabilia filling yards and yards of glass cases. Pirkle is right at home in the middle of it, telling tales about the older days, mixed with more recent recollections. The hub is also where you’ll find Dawsonville mayor Mike Eason, a welcoming man with his own family ties to racing. His second-floor office window opens to the back of the museum’s checkered-flag façade. That proximity is due to the fact that it’s a two-hall building — the Georgia Racing Hall and Dawsonville’s City Hall. But this address is also where you’ll meet Cheryl “Happy” Wood, who operates and holds court from the counter of the Dawsonville Moonshine Distillery, which sells Bill Elliott-branded small-batch spirits. The distinct smell of corn liquor mash often carries through into the Racing Hall, a present-day representation of the connection between stock-car history and its bootlegging roots. 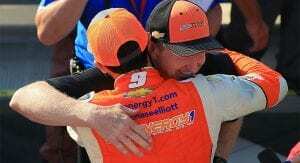 The town also is where Chase Elliott and his parents still maintain residences, clinging to the sense of community they’ve known their whole lives. For Chase, it’s a place to get away and enjoy a more relaxed pace apart from the race track, but it’s also a reminder of where he found his way in the sport. “My racing side of things has always been kind of centered here at Dad’s old shop,” Elliott says. “We did a lot of short-track racing out of the shop here. That to me is probably the most special memory because those were the days that kind of paved the way to NASCAR to have an opportunity to race on Sundays. Good people, but also very good racers. Dawsonsville has long been a breeding ground for stock-car renown. The driving talent of Hall and Seay, when meshed with Raymond Parks’ vision as a team owner, made all three stars in the hardscrabble days before NASCAR’s formation. Seay, killed in a 1941 liquor dispute, is buried in Dawsonville’s city cemetery, a vintage race car carved into his striking headstone. A brokenhearted Parks paid for the memorial, mourning the shortened career of a driver who, according to lore, could drive a Ford coupe up a Georgia pine. Grainy pictures of Seay navigating the turns of Daytona’s old beach and road course on two wheels make your brain try to believe the legend. Mark wouldn’t give his last name. The Army veteran wore a camo shirt and a low-crowned hat as the clerk at Dawsonville hardware made a spare key for his Dodge pickup just before closing time. He asked if I was lost. “Is it that obvious?” I offered. Mark said flatly, “Yes.” When I mentioned the purpose of my trip, Mark balked at the sight of my recorder but also reacted with mild confusion. Everybody here talks about what good people they are. Mark frequently punctuates his sentences with “dude.” The mention of racing, though, turns him to the subject of moonshine, where it’s made, and he dances around the secrets of the trade. He starts a story, then thinks better of sharing it around others inside the store. We step outside. There, within site of the old courthouse, Mark points up the road and details some of the hidden rituals of making illegal whiskey and the elaborate methods to keep the state man unaware: Pipelines under two-lane roads, tunnels into mountains, smokestacks funneled into creek beds to conceal a still’s tell-tale white smoke. We’re just a block away from Georgia’s Highway 9. Before Bill and Chase Elliott used it as their car numbers, Highway 9 was famous as a lifeline for whiskey trippers transporting their outlawed goods. The road snakes from the foot of the Southern Appalachians toward Atlanta. Driving its undulating curves today, it’s not too far of an imagination stretch to picture Seay or Hall kicking up dust on a high-speed liquor run under the cloak of night. Moonshining used to be broached in whispers, a wink and a nod. Today, the deep-rooted underground part of Dawsonville’s culture is celebrated out in the open. Well, mostly. In two weeks, Dawsonville’s normal civic operations will shut down to raise a collective jar at the Mountain Moonshine Festival. The three-day weekend attracts a collection of historic cars, visitors and distillers in a public embrace that briefly swells the town’s population to an estimated six figures. 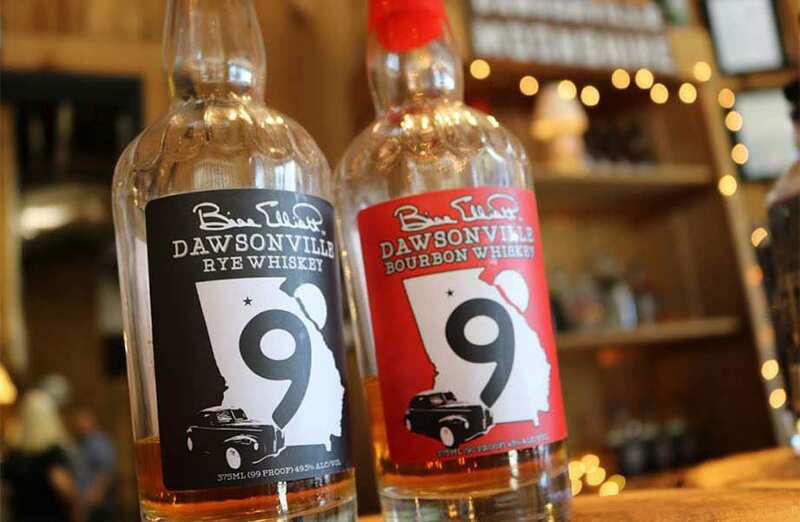 “We always say ‘Running ‘shine down Highway 9,’ ” Cheryl Wood says from the Dawsonville distillery, where the bottles depict a bootlegger’s car with the highway sign as a backdrop. She likes to claim that Dawsonville was home to the first all-night gas station, which enjoyed the brisk business of refueling whiskey runners’ cars in the wee hours of morning. She’s also the seventh generation of her family to make moonshine, but the first to do so legally. For that, Wood said she partially has Bill Elliott to thank. “I never drink it. I just burn it in the car,” Bill once said in his 1980s heyday. But Wood recalls Elliott’s testimony in the state capitol before a standing-room only crowd years ago, joining the call for reform to Georgia’s liquor laws. MaryKay Wood, no relation to the distiller, didn’t grasp what the commotion was at first. Sheepishly, she admitted she doesn’t follow NASCAR as closely as she used to, given her allegiances to recently retired driver Tony Stewart. So when folks started mass-parking on a recent Sunday in front of Dawsonville Antiques, where she serves as the store manager, she wondered. The Dawsonville Pool Room has that sort of draw. 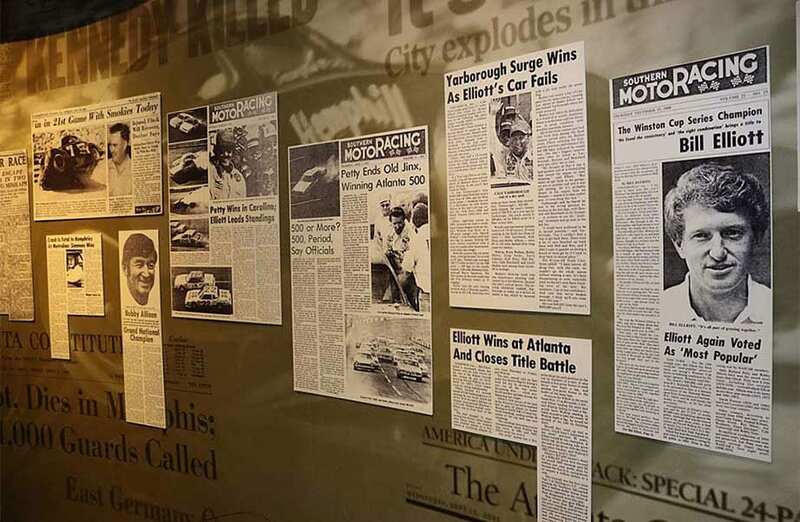 The restaurant’s place in history is secure, with yellowed clippings from the Atlanta Journal Constitution touting Bill Elliott’s successes papering the walls. There’s a $1 fee, payable to the tip jar, for any pool ball that hits the checkerboard-tiled floor. Customers are often called by their first name, and a to-go bag usually comes with a hug from whoever is behind the counter. Besides the hospitality, the Pool Room’s trademark is the siren, which sits perched atop a black and white pole on the back corner of the restaurant’s roof. It’s a roundabout story as to how it got there. Pirkle Sr. donated the original siren off a state patrol car to the volunteer fire department in the early 1980s. Two years later, the department had updated the alert system to sync with the sheriff’s department. Without a need for Pirkle’s siren, they gave it back. It sat unused until the 1983 season finale, when Bill Elliott finally broke into the win column at Riverside. “Some of them boys talked about going around the courthouse the wrong way, blowing horns — they wanted to do something,” Pirkle said. Improvising, Pirkle connected the siren’s wires to a drop cord and on Nov. 20 of that year, the patented celebration was born. Both Pirkles admit that the celebration for Chase Elliott’s recent win was not as frenzied as the party for his first, back in August. “Muted” might not be the best description for last Sunday’s toast, considering the decibel level of the siren, which can be heard for miles outside the center of town. He is bringing the town back to life, like his daddy did. Like Bill did. G.P. takes a break from the grill again, this time to talk about the other big NASCAR news of the week: the crew chief changes at Hendrick Motorsports that will break up the 17-year partnership forged by Jimmie Johnson and Chad Knaus. In the next breath, the younger Pirkle says he hopes Hendrick keeps the combination of Elliott and crew chief Alan Gustafson — currently the organization’s fastest team — together. Dawsonville’s recent cheers arrived with a mass exhale. After an agonizing eight runner-up finishes, Elliott landed his breakthrough win in his 99th career start, tinging the town’s jubilation with equal measures of relief. 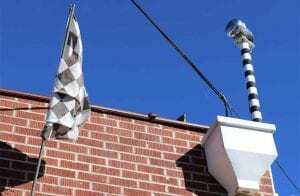 And that’s after the siren ran for nearly half an hour Sunday, calling out from the center of town to signal another new chapter in Dawsonville’s flourishing racing history.